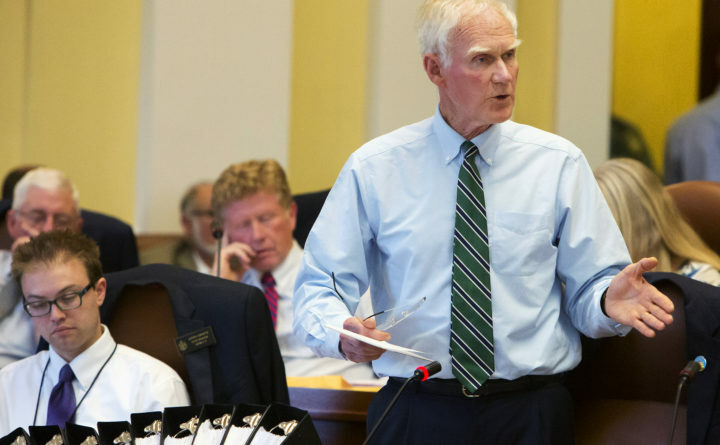 Sen. Brownie Carson, D-Harspwell, sponsored legislation requiring that the LePage administration restore the state's public health nursing program. He's pictured here at the Maine State House on June 30, 2017. Sen. Brownie Carson filed a lawsuit in Kennebec County Superior Court on Monday asking the court to order LePage’s administration to hire the nurses within 90 days. The lawsuit also requests that the court appoint a special auditor to ensure the Maine Department of Health and Human Services complies with any court order. Carson and two nurses who are joining him in the lawsuit as plaintiffs “are seeking nothing more than what the law already requires,” reads the suit against Health and Human Services Commissioner Ricker Hamilton. Traditionally, public health nurses in Maine have conducted home visits with at-risk mothers and infants, including addicted mothers and drug-affected babies, to monitor their health; provided school nurse services in rural schools without their own school nurses; worked to contain infectious diseases such as tuberculosis; and assisted in responses to public health emergencies. The two nurses who are part of the suit, Sarah DeCato of Bethel and Donna Ellis of Alfred, both applied for public health nursing positions after the 2017 law took effect but were never hired. Lawmakers have continued to provide funding for public health nurse positions throughout the LePage administration, but the administration has filled few of the positions that have become vacant, diminishing the public health nursing program’s reach. At the 2011 start of the LePage administration, the state employed about 50 public health nurses, plus their supervisors, program consultants and a director. As of June, according to the Legislature’s Office of Fiscal and Program Review, 19 of the state’s 42 current public health nurse positions were filled. Half of the program’s four supervisor positions were vacant as well. Carson last year sponsored legislation requiring that Maine DHHS fill the public health nursing positions for which the Legislature provided funding, after reading a 2016 Bangor Daily News article about the program’s dismantling. The legislation overcame a veto by LePage to become law. It set a March 1, 2018, deadline for the state to make the required hires, but the state still had more than 20 positions to fill when the deadline passed, and it had stopped advertising the open positions. In May, a public health nursing supervisor told Ellis, who was inquiring about the status of the position she had interviewed for in January, that the LePage administration had “put a pause on [hiring] at the beginning of February,” according to an email included in Ellis’ affidavit filed with the court. When asked about the stalled hiring earlier this month at a Government Oversight Committee hearing, Hamilton, the DHHS commissioner, told lawmakers his department had recently hired a public health nursing program director but that the department had to receive approval from LePage’s office before it could hire public health nurses. Shannon, a Portland-based lawyer for Verrill Dana who took on the public health nursing case pro bono, said the legislation sponsored by Carson removed any question in Maine law about DHHS’ obligation to hire public health nurses. “Whatever discretion the department had previously, or once had, the Legislature concluded it was abusing that discretion,” he said. A spokeswoman for DHHS said Monday she couldn’t comment on pending litigation. A spokeswoman for Attorney General Janet Mills didn’t immediately respond to a question about whether Mills would defend the state against the lawsuit or authorize the LePage administration to hire a private lawyer, as she’s done in a number of other cases. Mills testified in favor Carson’s legislation when it was pending before the Legislature. DHHS has released little information about its management of the public health nursing program and the actions it’s taken in response to the 2017 law. In May, the department said it would cost Carson more than $67,000 to fulfill a public records request for much of this information. That’s why the lawsuit requests that the court appoint a special auditor “to quickly spot the kind of intransigence, evasion, foot-dragging, and misinformation the Department has exhibited to date,” the filing reads. DeCato wanted to return to the program she had left in 2014 to participate in its rebuilding. While DHHS leaders have cited a shortage of qualified nurses as an obstacle, DeCato said her and Ellis’ experiences show that qualified, experienced nurses wanted to work in public health nursing, and the state turned them down.